The odyssey of the Syrian refugees, of attempting, though to no avail, to pass the Turkish border into Greece, has lasted ten days. In Edirne, approximately five-hundred, who were staying in the sport’s arena assigned to them by the city’s prefecture, left the Thracian city on September 24. Some of the more tenacious of them put up a few more hours of resistance to police officers, who wanted to put them on the buses heading to the expulsion centre in Edirne. Among those who accepted to leave of their own accord, some of them have returned to their places of origin, others are headed towards the Aegean coast, where on a daily basis dozens of refugees attempt reaching the Greek islands by sea, risking their lives. The growing awareness of the dangers that involve crossing over by the sea was what brought the migrants to embark on a new route to Europe. The image of Aylan Kurdî’s little body, on the beach near the Turkish tourist town of Bodrum last August, became a symbol worldwide. According to the International Organization for Migration (IOM), 224 people have lost their lives since the beginning of 2015 trying to cross the Aegean Sea. On September 20, another boat of fortune sank off the coast of the Dardanelles, causing the death of 13 adults and one child. Encouraging the refugees to attempt the “route by land” have also been the recent statements of the German government, that claimed its willingness to welcome several hundred thousand refugees. Thanks to the news being divulged through social media, on Monday September 14, hundreds of refugees started to pour into Edirne, in Turkish Thrace, with the aim of crossing into Europe. Many arrived to the city by bus, others by foot, on the highway, others still were blocked at the Istanbul Bayrampaşa bus station. Turkish authorities are ordering transportation companies not to sell tickets to Syrians. And in the last week, the refugees that tried to resist these pressures by starting even a hunger strike, were gradually “convinced” to leave the encampments. But to definitely close the door on the hopes of the Edirne refugees, seems to have been the final decision of the European Council to redistribute the 120 thousand migrants already present on European territory, which consequently closed the road off to new arrivals. On September 25, even the Premier Ahmet Davutoğlu, who had received the representatives of the Syrian groups waiting in Istanbul and in Edirne, urged them to “return to normal life”. But maybe it’s precisely because of this “normal life” carried out by Syrians in Turkey, that so many seek to move on to Europe. A life where actual integration within the society turns out to be limited for various reasons. First of all for the fact that Ankara does not recognize refugee status to the displaced. In the last four years Ankara has received more than two million two hundred thousand refugees, dedicating more than 6 billion dollars to them and putting up 24 reception camps in ten provinces along the border with Syria. Nevertheless, the refugees (not just Syrians, but everyone arriving from the East), as a consequence to the geographical reserve given to Turkey in the 1951 Geneva Convention – signed also by Ankara – will not be able to be recognized with refugee status, but end up being labeled as “guests”. Hence these people, according to a law passed in 2014, have "temporary protection" rights. As pointed out in recent studies, “temporary protection” allows the refugees to have access to health services, education and social aid, but not to a completely valid stay permit. “Current legislation deals with the Syrian situation as a transitional problem and doesn’t aim to adopt an approach based on the recognition of rights”, asserts Zümray Kutlu, a scholar. Often it’s also the bureaucratic tangle that keeps the “Syrian guests” from being able to access services offered by the authorities, all the while language being the ultimate obstacle. Aside from the approximately 250,000 refugees settled in the camps, who benefit directly from the state subsidies, about 2 million Syrians have to organize their lives autonomously. From work to education, and up to health services, some rights that are granted in theory, fail to be met in reality. Current regulations hinder the Syrian’s entry into the labour market. Getting a work permit is possible “on paper” for the refugees who are legally registered in the government database, and restrained to specific work fields established by the Council of Ministers, but in real life it turns out to be almost impossible. The consequence is that many Syrians are forced to work under the table, exploited and with a reduced pay by 80% compared to a Turkish citizen for the same duties. And the situation also impacts minors. Education of Syrian children is another important problem. 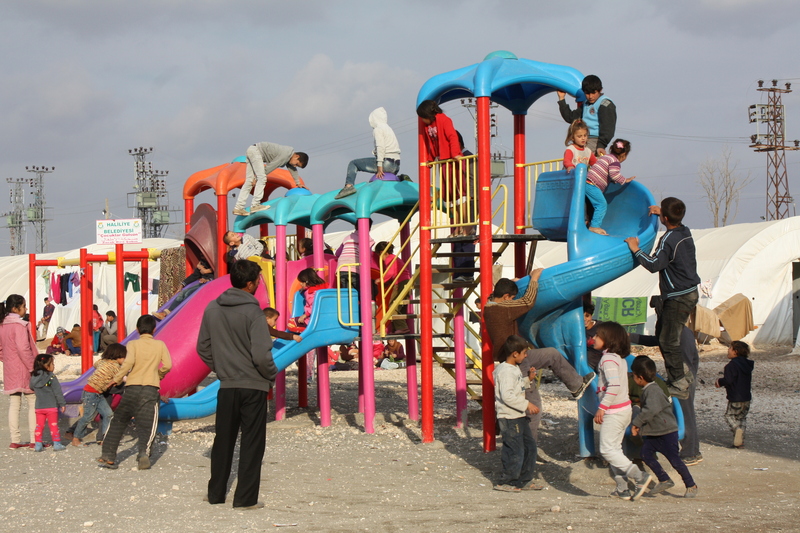 Several studies point out that schooling levels of the children living outside of the camps is between 14% and 17%. When it comes to access to health services, even if the basic services are guaranteed and free for Syrian citizens who are registered in the government database, these same refugees denounce that the approach of single hospitals tends to be variable and subjective. And while in densely populated cities, such as Istanbul, integration turns out to be easier, in smaller communities episodes of intolerance are being registered. Syrians are considered responsible for the increase in rental housing costs and for employment hardship – given that they accept to work for less. “Syrians don’t want to take the bus or speak Arabic for fear of revealing themselves”, explains Şenay Özden, an activist and field researcher. Up to a few days ago she was in the Basmane quarter in Izmir, another central location for refugee departures towards Greece. “A new trend that I’ve noticed”, the scholar explains during an interview at Açık Radyo regarding the refugees in that area, “is that many Syrians – but there are also many Pakistanis, Iraqis, Egyptians, Ethiopians and others – appear to have arrived recently in Turkey, and from regions such as Damascus or coastal areas that are under Syrian regime. So they aren’t escaping because they are being threatened. Many of them are public employees and left a steady job in order to come here. This shows that no one feels safe in Syria anymore”, she added. While the number of refugees present in Turkey seems to be destined to grow, the European Commission announced the allocation of funds for Ankara, in order to facilitate refugee reception outside of the EU borders. The intention, despite the Readmission Agreement signed between Ankara and Brussels (for which, in exchange, Turkey expects free circulation rights for its citizens within Europe), would be that of keeping the refugees within Turkish territory, which is being used as a sort of “buffer zone”. But how much these measures will actually be useful to the refugees who live outside of the camps, to help them integrate within Turkish society, remains the biggest question.